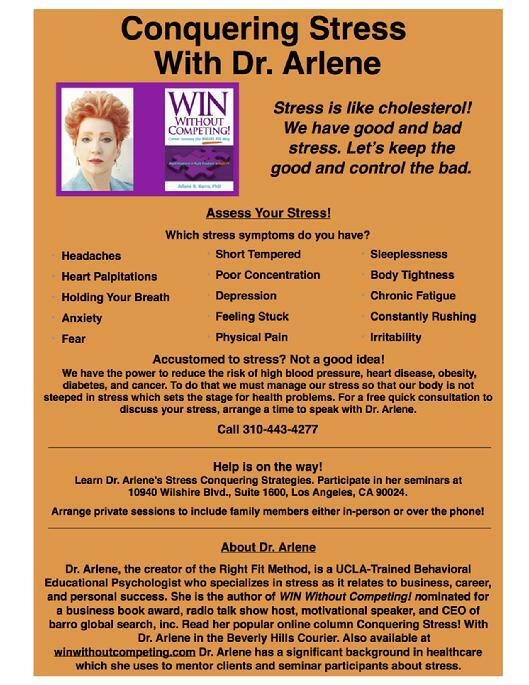 Conquering Stress With Dr. Arlene Ignites Success! For upcoming seminar dates, email Dr drbarro@barroglobal.com or call 310-443-4277. The seminar fee depends on the length and location of the seminar. To register, mail a check to barro global search, inc, to the location address below. For alternative payment method, contact Dr. Arlene. Email drbarro@barroglobal.com or call 310-443-4277. Registration will be closed when seats are filled. Allow 5 days for mailed payment to be received. Interested in shedding your cloak of stress? Register early! Seating limited. Street Parking on Ashton, Midvale, Wellworth. where Dr. Arlene will greet you. Note: The seminar will start promptly at 6:15PM. No late seating! Get ready for a fast-paced, dynamic, interactive seminar. See you there! A toast to your good health! Email dr.barro@winwithoutcompeting.com for information on registration. 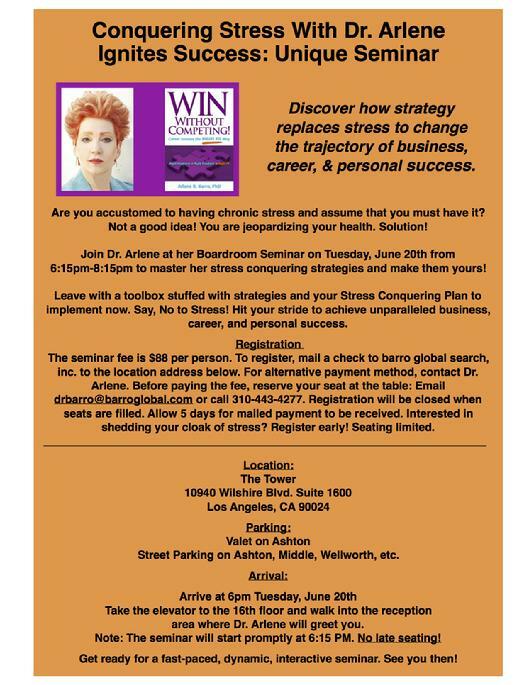 Listen to: Conquering Stress With Dr. Arlene Ignites Success: Unique Seminar on BlogTalkRadio for a sneak peek of the seminar! Read the popular column Conquering Stress! 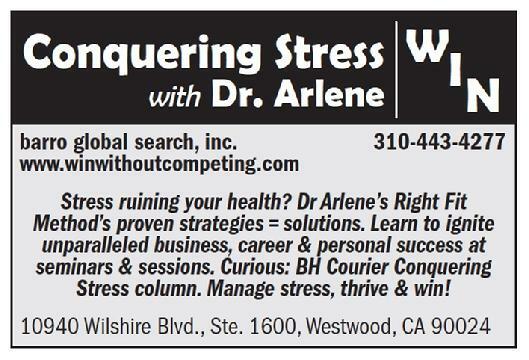 To read Dr. Arlene's column on the Beverly Hills Courier website, google the title from the list below. The latest column is listed here last. Dr. Arlene Barro, in her book WIN Without Competing!, shares her unique, proven Right Fit Method to teach you the secrets of her success as a search consultant (read the Foreword by the Founding Editor-in-Chief of WebMD), Professional Mentor and Personal Mentor. Many people that Dr. Arlene has worked with have been searching for the Right Fit career, the Right Fit job, the Right Fit spouse, the Right Fit house and even the Right Fit children. What's amazing is that they did not recognize that they were searching for Right Fits. They thought that they were searching for the "best" and selected wrong fits. After reading her book and working with Dr. Arlene they started using the Right Fit Method which changed their lives.